Ever since I found tiny yellow potatoes at Trader Joe’s last year, I’ve been planning how to grow some for ourselves. The flavor of those little potatoes is incredibly close to my favorite papas criollas from Colombia and after tasting them in ajiaco and clam chowder we knew we had to try them in the garden. Even if you don’t decide to try growing them, look for the nets of Teeny Tiny Potatoes—yes, that’s what they are called—at Trader Joe’s in the fall; they do amazing things to your favorite soups. We roasted some with olive oil, kosher salt, and pepper for Thanksgiving eve dinner with my family, and everyone went crazy over them. I looked all winter but just couldn’t find seed potatoes that seemed to be a good match, which meant we couldn’t plant them in the spring garden. Since these little potatoes don’t come to the stores until fall, we decided to try planting them in containers and growing potatoes indoors this winter. When I saw them at our local TJ’s last month I grabbed several bags and set aside two for planting. We left them alone for a while, waiting for eyes to develop, then we readied the soil and pots. We mixed some peat moss with potting soil and put about 3 inches of the mix in the bottom of each pot, then we scattered potatoes around and topped them off with our homemade compost and more soil, making sure it wasn’t too deep. 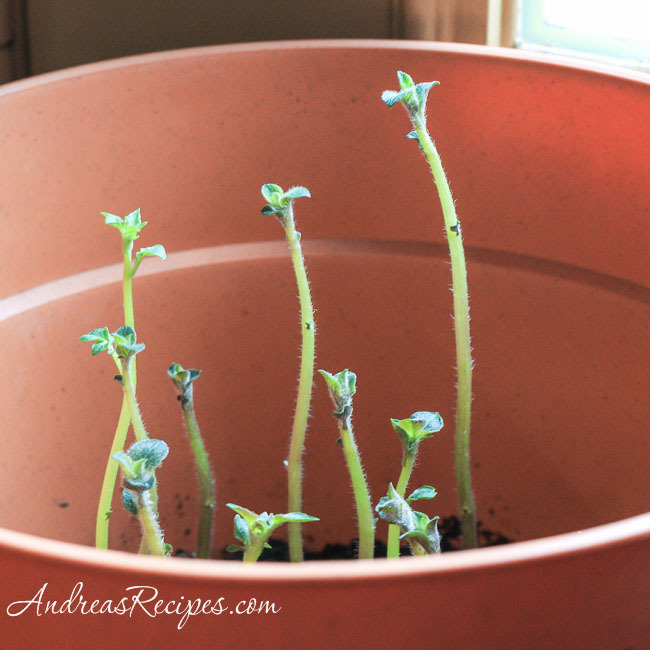 Our original plan was to leave the pots on the deck for a couple weeks until they sprouted, but we were already having freezing nights and hard frosts, so we decided to just go ahead and bring them indoors and keep them by a southern window. For a couple weeks I wondered if they would sprout, and when I didn’t see any little stems poking out of the ground after Thanksgiving I almost gave up hope. Then last weekend we spotted the first stems and we got excited, and watched with delight as they got taller every day this week. Even Monkey Boy proudly stood by the pots, pointing and shouting, “Look Mommy! They’re growing!” Now some of the stems are tall enough that we need to add more of our compost and soil mix, and we’ll continue to do that as they grow taller. So far the tiny yellow potato experiment seems to be working, and I’ll continue to post photos as they grow in our winter indoor garden.